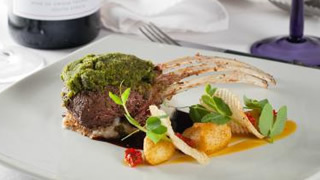 The Monneaux Restaurant in Franschhoek offers contemporary cuisine in the heart of the valley. Set on the original site of Franschhoek’ s first perfumery, the acclaimed Monneaux Restaurant is a Cape culinary classic. At Monneaux, lunch is enjoyed on the fountain terrace under a spreading pepper tree while dinner is enjoyed in the elegant yet relaxed dining room in the original Manor House. Even by the food and wine capital of the country’s high standards, Monneaux Restaurant in Franschhoek is an extraordinary success, having been in the country’s Top 100 list for 6 years consecutively, on the Top 10 list for two years and winning the American Express Platinum Awards for fine dining. The underground cellar at Monneaux is available for private functions where dinner can be enjoyed by an impressive selection of local and international wines. The restaurant’s bar lounge provide a comfortable environment to relax and enjoy the company you’re with. The Monneaux Wine List emphasises the boutique wines of the Franschhoek Valley as well as an impressive selection of other award winning wines of South Africa and received the Diners Club Diamond award in 2012.